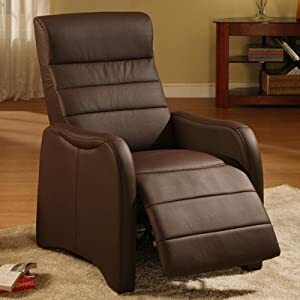 30450 Features: -NO Tools Required -- EASY 2-Step.-Extremely durable.-Stain Resistant and maintenance free.-Comfortable easy push-back with pop-up leg rest in a single motion.-Flame retardant foam cushion.-Ships via UPS for your convenience.-Sinuous spring seat cushion support for added comfort. Color/Finish: -Chocolate colored faux leather. Dimensions: -Seat width: 20''.-Seat depth: 22''.-Dimension: 31.5 - 42.5'' H x 29'' W x 35 - 61.5'' D. Warranty: -1 yr-limited warranty.